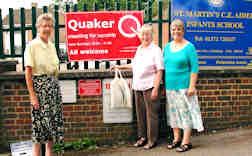 We are a small but lively Quaker community in Epsom, forming part of South London Area Quaker Meeting. Unlike our sister meetings at Sutton, Croydon, Purley and Streatham we do not have a meeting house of our own, but we do hold a public meeting for worship "after the manner of Friends" every Sunday from 10:30 to 11:30 am at St Martins C of E Junior School, Ashley Road, Epsom, Surrey KT18 7AD. Our meetings are open to all, regardless of their personal beliefs and nominal religion (if any). Do feel free to join us without prior notice. You will find yourself warmly welcomed, but not confronted with ardent proselytising or pestered to come again if you do not find yourself at home with a meeting held largely in silence. Thursday afternoon events (see contact below for details).